Common causes of howling or loud meowing in cats include medical issues, attention seeking, stress, grief, boredom, feline cognitive dysfunction syndrome, and breed tendency. If a formerly quiet cat has begun crying or howling plaintively, the cause is likely a medical problem. Cats tend to be stoic, often not showing symptoms until an illness has become quite severe. In such cases, the howling is caused by physical and psychological distress. When howling starts up suddenly, consult a veterinarian as soon as possible. Medical problems should be ruled out before attributing the behaviour to other causes, particularly if the cat is eating or drinking more than usual or has started having accidents outside the litter box. Older cats are prone to kidney disease and hyperthyroidism, both of which may cause howling. Many cats learn that talking results in feeding, affection, or some other form of interaction. A cat that is desperate for attention may yell just to get a reaction, even if it’s a negative one. If owners want to discourage chattiness, they should not pay the cat any attention (positive or negative) while he is vocalizing, but spend more quality time with him when he’s being quiet. Ignoring him when he’s noisy will send a strong message that howling won’t get him what he wants. Some cats howl due to anxiety caused by major changes, such as moving house or adding a new person or pet to the household. The loss of a person or animal the cat loved may also cause howling due to grief. In either case, provide plenty of positive attention and try to keep other aspects of the cat’s life as consistent as possible by maintaining the usual routines and not imposing additional changes. Many owners find that using a cat pheromone product such as Feliway has a calming effect. Have pets spayed or neutered to eliminate the biological urge to roam (this will also prevent yowling as a mate-seeking behaviour). Engage in regular play sessions that enable the cat to practice his hunting behaviours – tiring him out with play in the daytime is particularly useful for a cat that tends to be noisy at night. Leave solo toys such as catnip mice lying around for him to play with on his own. Harness train the cat and take him for walks. Provide some entertainment, such as a fish tank or a screened window with a view of a bird feeder. Grow some cat grass and catnip indoors. Hide treats around the house so that the cat can engage in a scavenger hunt that satisfies his natural hunting urges. Provide lots of attention and affection when the cat is quiet (but ignore him when he howls). If the cat is alone for long periods of time in the day or night, consider having a friend or relative pop by to provide some attention, as he may be howling out of loneliness as well as boredom. Like people, some cats suffer a cognitive decline as they get older, developing a condition much like Alzheimer’s disease. Cats with feline cognitive dysfunction syndrome (CDS) howl due to confusion, disorientation, and distress. Also known as feline dementia, CDS can impair a cat’s sleep cycle, which increases the likelihood of night-time vocalization and restlessness. A cat with CDS may howl because he feels anxious due to confusion or because he’s looking for others in the household and can’t find them. Cats that suffer from CDS may be more inclined to vocalize at night in particular because their loved ones become inaccessible when they fall asleep. Loss of hearing or vision in older cats may also contribute to howling. Older cats may develop additional medical conditions, so a full check-up is required to rule out illness before assuming the problem is dementia. A veterinarian may prescribe medication in the case of severe anxiety. Once medical problems have been ruled out, options for calming the cat’s anxieties include using a pheromone product such as Feliway, spending more quality time with the cat during the day, and hiding treats or catnip toys around the house to provide pleasant distractions at night. 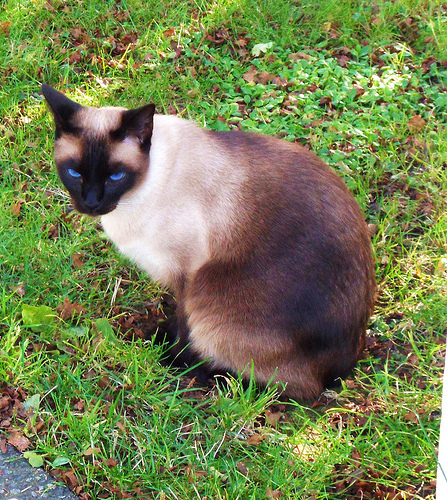 Siamese cats (and many breeds derived from the Siamese), tend to be more talkative by nature. In the case of naturally chatty breeds, if there have been no changes in vocalization (loudness, frequency, etc. ), talking is unlikely to indicate a problem. For more insights into cat behaviour, visit the Cat Psychology, Communication, and Behaviour page. For a full list of cat articles, see the main Cats page. ASPCA Virtual Pet Behaviorist. (2009). 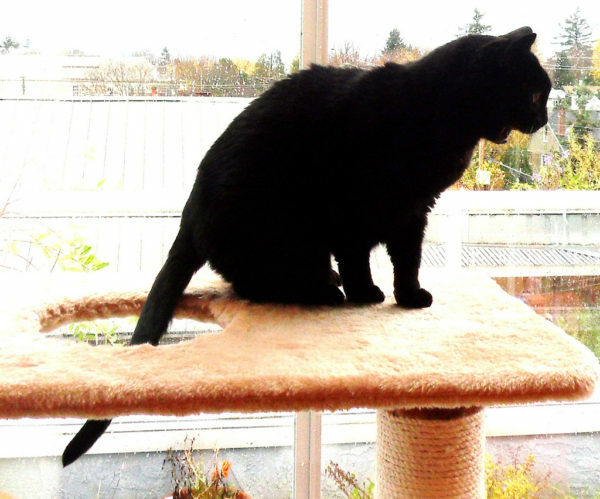 “Meowing and Yowling,” “Behavior Problems in Older Cats,” and “Enriching Your Cat’s Life.” ASPCABehavior.org. Sacramento SPCA. (2008). “Your Talkative Cat.” SSPCA.org. Sueda, K., DVM., Best Friends Animal Society. (n.d.). “The Talkative Cat.” BestFriends.org.